Electronic Journal of Turcology Researches is the first electronic Turcology journal, founded in 1998 to publish studies on Turcology and related topics, articles, description, and reviews in online media. Turcology, which is called by various names in Turkish, is a discipline that covers the studies of Turkish language, history, literature, and folklore in a narrow sense. Those who published the journal for the first time and served in its board were Turcologists who had personal e-mail and web-page together with internet access started in Turkey in 1994. The main purpose of our journal, which was published by the server named as Pamuk and given by Cukurova University in those times, is to be a first Turcology periodical publication only in virtual environment by carrying out all processes related to sending articles to our journal, their evaluation and correction if it is needed, and publishing them if they are seen as appropriate for the publication in electronic environment. Today, our journal, which these processes are carried out very easily through various servers was the first media organ in the field of Turcology in 1998. STAD, with its short name, has drawn attention in the Turcology world at the time when the internet has spread rapidly. News, articles, descriptions about our journal were published in some journals in those days. Our journal, which had two issues, had to give a break for a long time. 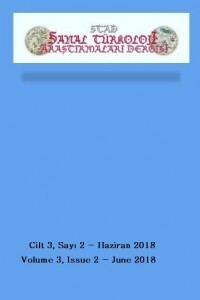 Our journal, which started to be re-published, is now published by DergiPark server. As in the year 1998 when the first issue of the journal was published, STAD publishes four issues in a year. Our journal, which is the first electronic journal, covers Turcology in a broadest sense and gives place to articles, reviews, descriptions, and news in the fields such as Turkish medicine history, Turkish economics history, Turkish science history, and Turkish sports history as well as Turkish language, literature, history, art, education, and folklore. The scientific and legal responsibilities of the articles published in the journal belong to their authors.